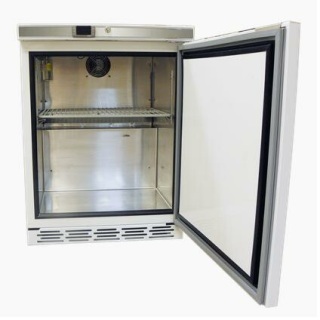 The Moderate ColdCube undercounter freezer offers a Digital LED display microprocessor temperature controller with Audible and visual Hi/Lo temperature alarm. The Adjustable control (-25°C to -35°C) is factory preset at -30°C. The digital controller offers remote alarm contact, continuous temp display, and product sensor with glycerin bottle yielding accurate product temperature, not just air temp. Exterior cabinet front, sides and top are white, back and bottom galvanized steel, and interior liner and door are smooth aluminum. Cabinet is foamed-in-place EPA compliant high density polyurethane foam insulation.